How to export from Chile? How to export from Chile? What are the export registration procedures, export customs process, export cargo movement methods in Chile? 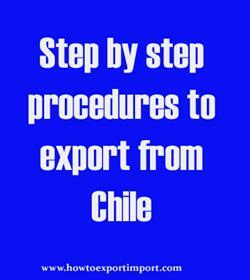 This post explains about step by step procedures that need to be finished with Chile government authority for exportation from Chile. All natural persons or legal entities are approved to conduct export and import process in Chile. But for commercial purpose, a registered trade with concerned license (if required) as per the business and have enlisted in the Trade and Company Register of the country is must for exporting and importing of products from and into Chile. The customs operations are managed by National Customs Service of Chile under the Ministry of Finance. The major responsibility allocated with them is to encourage and facilitate import and export activities through the improvement of customs procedures and formalities. If the goods worth exceeds USD 1,000, then the exporter must submit a DUS (Documento Unico Salida) or an embarkation order with the customs. This post explains about different phases in export process that every exporter needs to go through for completing export from Chile. How to export from Barbados? How to Import to Barbados? How to import to India from Barbados? How to export from India to Chile? FAQ about travelers to India on import duty exemption Frequently asked questions.